I have been testing out Jane shimmering bronzer for the past few weeks. The bronzer costs around six dollars and I bought it at Walgreen's. The powder contains a variety of different colors ranging from brown to gold. The shade I am using is Tahiti (shown left) and it works well with my fair skin. The bronzer is not heavy and it is easy to wash off. It also gives you a nice glow to your face, but it does seem to fade throughout the day. When you use this product, your face does shimmer and it is noticeable. It is perfect for night time, but it still looks pretty during the day. 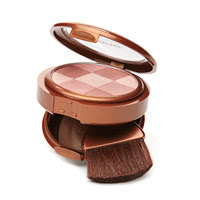 The bronzer is sheer so you can add more until you get the shade you like. This compact also contains a small brush with a mirror, but investing in a better brush is a smart idea considering that the one it comes with does not work well. This is a good product if you want a glow with some shimmer and for six dollars, it is worth trying out. You can get that glow without the sun! I have the blush and it works great! I posted something on my blog about it too a while ago! I bet the bronzer works just as good!